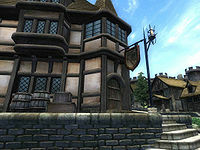 The Oak and Crosier is the "respectable" inn in Chorrol, located in the city's Fountain Gate. It is found across the street from Northern Goods and Trade and Fire and Steel and next to Renoit's Books. The publican, Talasma, buys potions and food while only selling the latter. The ground floor consists of the main reception area, the dining room, and a bar. Upstairs is a small leisure quarter with a library, while the rooms for rent are down a small hallway. Above the doorway leading to the rooms is a sign that reads "To achieve the impossible dream, try going to sleep". Occasionally, Chorrol citizens can be heard saying: "I could be wrong, but it seems to me there's something shady going on at the Oak and Crosier." Between the completion of Legacy Lost and the completion of Sins of the Father, Fathis Ules can be found in the inn. While Talasma says "The Oak and Crosier is the place of choice for well-bred visitors to Chorrol. The Grey Mare is more suitable for... others." both of the inns are priced exactly the same for a room. Entering the inn's locked basement triggers dungeon exploration music, despite the building being monster-free. The music and the above rumor may be indications of an unfinished quest involving the inn. Esta página foi modificada pela última vez à(s) 03h02min de 6 de julho de 2013.